From face-transplant surgery to Formula 1, I’m fascinated by the limits of our attention span and how we can improve it. In search of insight, I’ve spoken to a wide range of experts and high-performers in some of the most technically and cognitively demanding environments. While writing my most recent book, I met with Jyrki Törnwall, a world-leading oral and maxillofacial surgeon. I wanted to find out more about how attention, focus, and concentration are expressed in his work, in particular during face-transplant operations. Jyrki began his career as a cellist, studying at Helsinki’s prestigious Sibelius Academy, before moving into medicine. I was surprised to discover the significant role that music plays in his work today. “The surgeries themselves follow their own rhythms and intensities,” says Jyrki. The performance-enhancing potential of music has been studied for over 45 years. 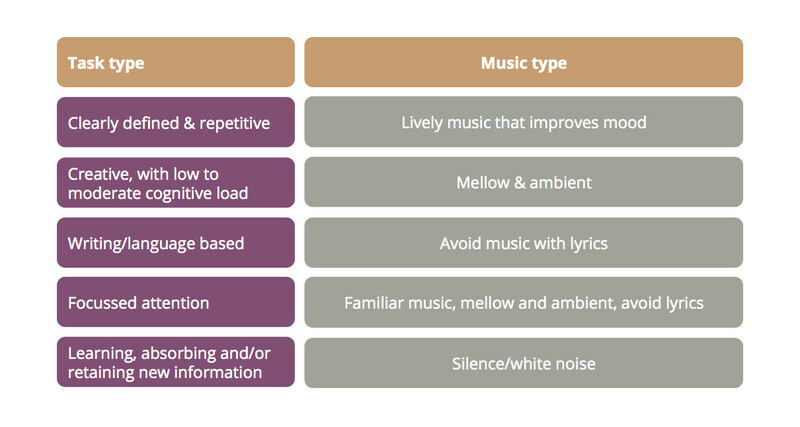 While it appears that music may compete for our attention during some tasks, in certain contexts it may be beneficial, providing you select the appropriate genre. During clearly defined and repetitive tasks, it appears that lively mood-enhancing music can improve productivity. Other studies suggest that melodic, harmonious music may improve concentration. A 2015 study described how listening to classical music altered the activity of genes associated with dopamine secretion, transport, and synaptic neurotransmission, which may have implications for learning and memory formation. However, it appears that music featuring lyrics may have a negative impact on attention and performance during tasks that require language processing. From personal experience, Jyrki concludes that classical music is most appropriate for the precision needed to connect arteries that may only be 2 to 4mm in diameter, using thread one-tenth the thickness of a human hair. “Nerve cells are easier,” Jyrki explains, “but veins can be the toughest because the walls are like jelly. 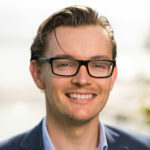 Gradually you learn and learn.” Jyrki’s 15 years of cello playing and high-level recitals trained his brain and hands to work in concert, but he believes the discipline of mastering a musical instrument also helped him prepare for the intense focus that microsurgery requires. However, Jyrki explains that the pace and intensity of focus during operations are not constant: the performances have their own adagios and andantes. “There are some parts I know I can move through quite quickly, but then for certain things, like tissue manipulation, I need to slow down again.”, he says. I was interested to find out more about Jyrki’s preparation for the intensity of surgery, and he again drew comparison with musical recitals. Both require long periods of careful planning. Jyrki and his team must prepare meticulously for each surgery. With face-transplant surgery, there are few life-like ways to rehearse, so Jyrki has trained himself to prime his attention and focus for the performance through detailed mental rehearsal. A face transplant surgery has 83 checkpoints and Jyrki goes through each one, paying careful attention to simulating and working through them in his mind. The words ‘attention’ and ‘concentration’ are often used interchangeably, but there are subtle distinctions. Attention is the process of exerting mental effort on specific features of our environment. Concentration is a facet of attention when we focus on the most relevant stimuli in relation to a task. You could imagine your attention as a ‘mental spotlight’, a concept first proposed in the 1980s. We move the spotlight to concentrate on what we think is most important. This can include external targets, such as the world around us, as well as illuminating our internal world: our thoughts and feelings. Our concentration is never truly lost, but it can be directed at the wrong place. If you’ve ever entered a room, been momentarily distracted, then realized you have forgotten why you walked in there in the first place, you know what I mean. Our spotlight is often displaced because of distractions and interruptions. We are distracted and interrupted by information in our internal or external environment that is not relevant to our immediate goals. Distractions are distinct from interruptions because distractions occur against our will. In contrast, interruptions are more conscious. For example, you may experience an external distraction when you hear an alert from your mobile phone, momentarily drawing your attention away from the task in hand. Mind wandering is a frequent source of internal distraction, like when you wonder mid-conversation whether you locked your front door. Even if we would prefer to ignore them, distractions are hard to resist. 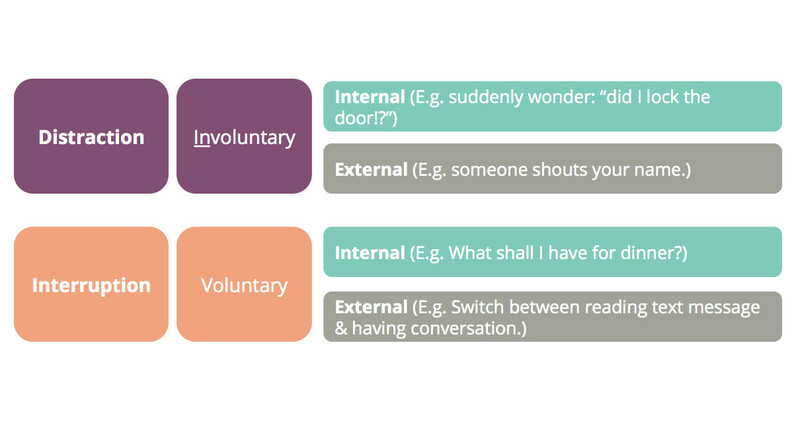 In contrast, interruptions are voluntary. They occur when we choose to engage in a new task, in addition to a current task. This usually results in rapid switching between tasks and a reduction in cognitive performance. For example, an internal interruption may occur when you’re listening to a dull presentation and find yourself wondering what to have for dinner while trying to keep track of the major points in the speech. Mobile devices present a common form of external distraction, leading to the infuriating habit of people simultaneously trying to hold a conversation with you while reading a text message. Of course, I have never been guilty of that. 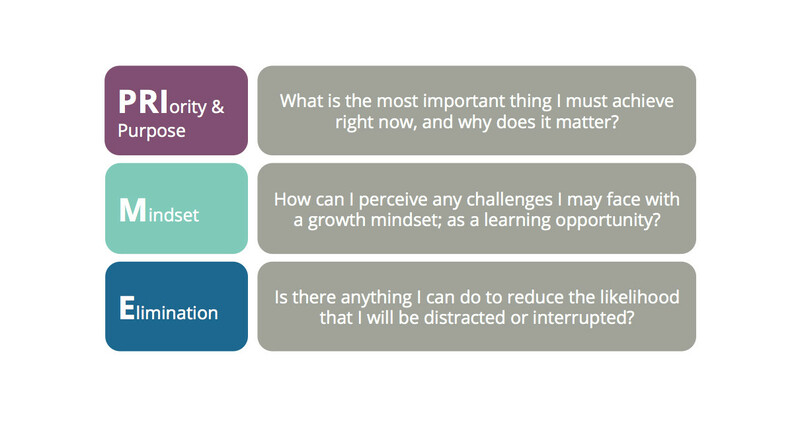 Distractions and interruptions are both a form of interference that can increase unhelpful forms of stress, diminish our performance and prevent us from achieving our goals. Unfortunately, human beings are very susceptible. One view suggests our vulnerability is due to the relative sophistication of our goal-setting abilities relative to our cognitive-control capabilities. Humans are very good at setting goals. This has enabled our species to thrive and populate a wide variety of environments. 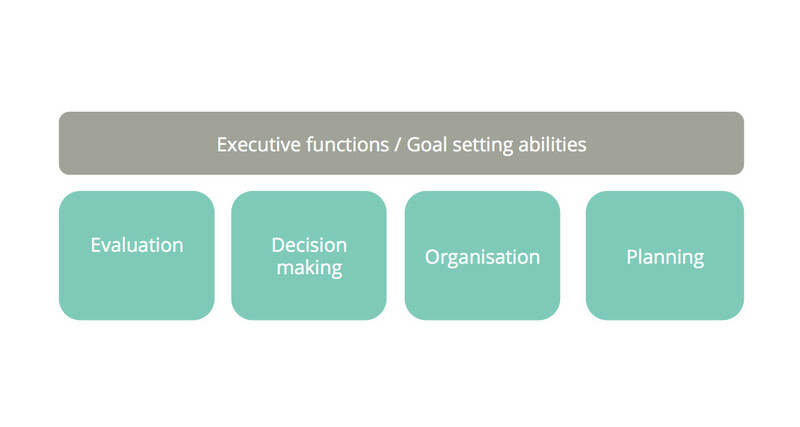 Our goal-setting abilities can be described as ‘executive functions’, including evaluation, decision-making, organization and planning. 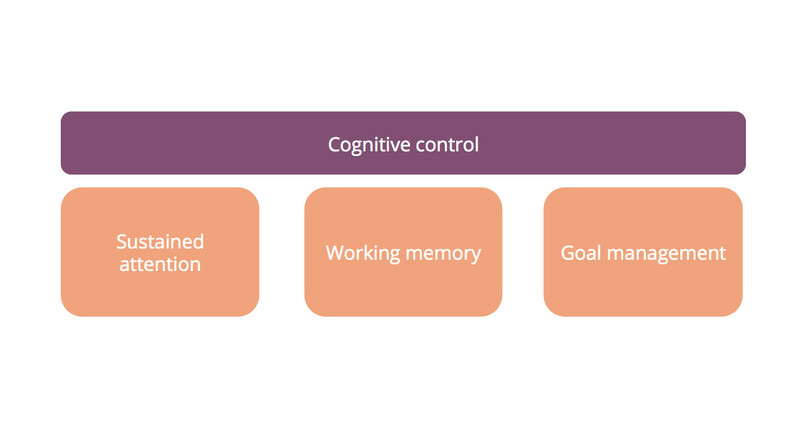 Cognitive control includes the number of items we can hold in our working memory and our capacity to manage multiple goals. For much of human history, our goal-setting abilities have been relatively well matched with our capacity for cognitive control, but our current ways of living and working expose our weaknesses. In our ancient past, progress was aided by people obtaining as much information as was available. Consider humans in a village society with the aim of expanding their territory and resources. It would serve them well to seek as much information as possible, to search for new experiences and explore what lay on the other side of the mountain. The environment and available technology would rarely overwhelm their ability to evaluate, make decisions, organize and plan. In contrast, today’s knowledge worker has the same desire for novelty and new information, but the access to information provided by new technologies often overwhelms our limited cognitive control capabilities. We need to take steps to manage our attention and concentration, to avoid distraction. We may need to restrict our access to information to provide the best opportunity to achieve our goals, whether we are conducting microsurgery, or trying to complete an article on time. A single face transplant surgery takes 24 hours, and the working time around it, in preparation and follow-up, is even longer. Along the way, nurses change every six to eight hours, but the surgeons have to keep going. How can one human being perform optimally for such a long period? “You can’t just put down your scalpel and say ‘now I’ll take a six-hour break’,” laughs Jyrki. 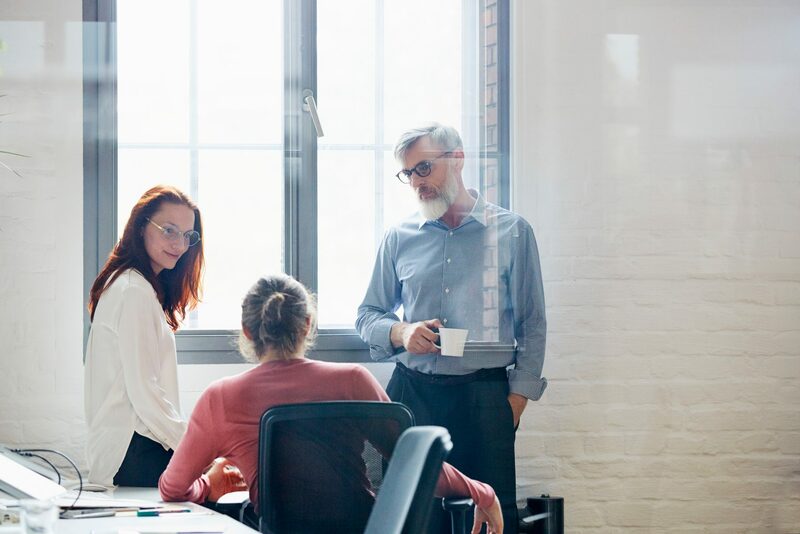 “I’ve been able to build up my abilities to deal with it over time.” It takes time to develop your capacity to sustain attention and requires planning to structure your environment in a way that is conducive to producing your best work. I suggest that you try the PriMe method for yourself. Begin with relatively short periods of unbroken concentration, and aim to make progress, rather than achieve perfection. Unless, of course, you are performing intricate facial surgery.